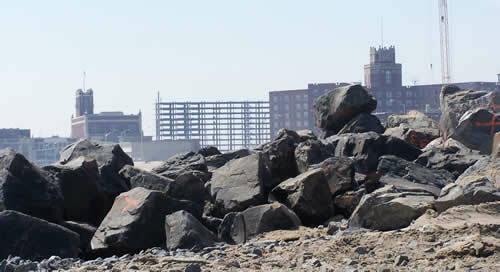 Five thousand tons of jetty rock obtained from the Deal Lake flume reconstruction project will be deployed at the Sea Girt Reef Site during the period of August 28 – September 18, 2006. The Sea Girt Reef site is located 3.8 miles northeast of Manasquan Inlet (Monmouth County). The rock will be deployed by hopper scow in three loads as part of the division's Artificial Reef Program. These basalt rock boulders will provide thousands of recesses and gaps for lobsters and crabs. They will also provide a superb attachment medium for blue mussels, hydroids, barnacles and anemones. Fishes such as sea bass, tautog, scup, summer flounder, bergal and gray triggerfish will in turn utilize the new rocky reef for refuge and as a food source. All reef program deployments are subject to weather and sea conditions. For further information on this deployment contact Hugh Carberry at 609 748-2022.